1. What: Become a Premium user: we will find someone you could swap with, also beetween different Album. same album swap i.e. we find a user which has your need cards and who need your spare cards for the same Album A. 2. Why: Even though this site is free, there is a way to gain a complete swap experience, lend a hand to the developer and show your support. 4. How: choose "Buy Now" button to complete the purchase via PayPal. 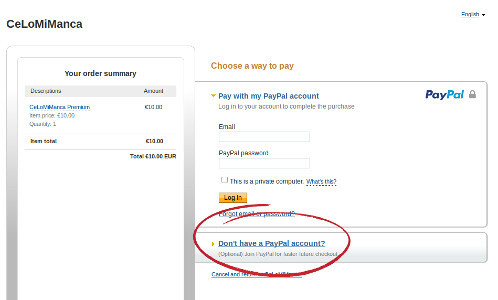 You could also pay without a PayPal account inserting on shot your credit card data. Swap Premium give you also same Album results. CeLoMiManca's One Year Premium Service costs 10€. One year means 365 days from the date of the purchase.